…AND the gorgeous shrine with the apparition chapel, the expansive square, the 8,900 seat church and exhibition — and the Basilica of our Lady of Fatima with the tombs of Lucia, Francesco and Jacinta. With my running shoes I covered all this ground for you — so you could join me on this intimate pilgrimage tour — to see a full documentary of it all with 147 photos, 21 videos with commentary and an interactive map. Enjoy! 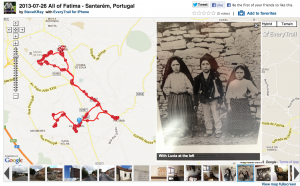 Click on the image above to enter the world of Fatima!